Is keratoconus associated with any other diseases or disorders? Does pregnancy affect the progression of keratoconus? Can progression in keratoconus be halted or reversed? Does keratoconus occur in families? What about relatives of people with keratoconus? When should my child be checked for keratoconus? Are there other conditions that can also cause thinning of the cornea? Can wearing rigid gas permeable contact lenses "cure" my keratoconus by flattening out my irregular cornea? Can wearing rigid gas permeable lenses make my keratoconus worse? Should I see a specialist contact lens fitter for keratoconus? Can I sleep in my rigid gas permeable contact lenses? I've been told my cornea is very thin, can my cornea perforate? What is hydrops? How can I tell if I have hydrops? Can I have Laser (LASIK) treatment to treat my keratoconus? Keratoconus is a thinning of the central zone of the cornea, the front surface of the eye. As a result of this thinning, the normally round shape of the cornea is distorted and a cone-like bulge develops, resulting in significant visual impairment. The cornea is the transparent dome-shaped window covering the front part of the eye. Like a headlight cover, it gives a clear window to look through and covers the iris (the coloured part) and the pupil (the black circle in the iris). The cornea focuses light and has the greatest effect on the focusing power of the eye, and often is the most important factor determining the strength of spectacles or contact lenses. Epithelium - the front layer, (10% thickness of the cornea), highest concentration of nerves in the body, very sensitive, 5-6 cells thick, heals very quickly. Bowman's membrane The next layer behind the basement membrane of the epithelium is a transparent film of tissue called Bowman's layer, composed of protein fibers called collagen. If injured, Bowman's layer can form a scar as it heals. If these scars are large and centrally located, they may cause vision loss. Stroma - the middle layer, (90% thickness of the cornea), very strong, overlapping collagen layers (like lasagne). Descemet's Membrane Behind the stroma is Descemet's membrane, a thin but strong film of tissue that serves as a protective barrier against infection and injuries. 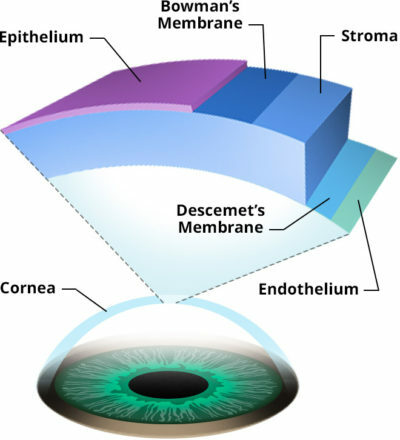 Descemet's membrane is composed of collagen fibers that are different from those of the stroma, and are made by cells in the endothelial layer of the cornea (see above). Descemet's membrane repairs itself easily after injury. Endothelium - inside layer, very thin, only a single layer of cells,acts as a water pump to keep the stroma free from fluid. Without this pumping action, the stroma would swell with water and become thick and opaque. In a healthy eye, a perfect balance is maintained between the fluid moving into the cornea and the fluid pumping out of the cornea. Unlike the cells in Descemet's membrane, endothelial cells that have been destroyed by disease or trauma are not repaired or replaced by the body. Keratoconus is estimated to occur in at least 1 out of every 2000 persons in the general population. However better screening techniques indicate that it may be as high as 1 in 500 persons. There appears to be no significant preponderance with regards to either men or women although due to genetic factors, it seems to have a higher occurrence rate in certain populations. The onset of keratoconus can be anywhere between the ages of 8 and 45. In the majority of cases, it becomes apparent between the ages of 16 and 25 years. Keratoconus tends to be more aggressive when diagnosed in adolescence. Progression usually continues until the age of about 40 years. Yes, keratoconus generally affects both eyes. Even though keratoconus is basically a bilateral condition, the degree of progression for the two eyes is often unequal; indeed, it is not unusual for the keratoconus to be significantly more advanced in one eye. Studies show that keratoconus occurs in one eye only in a very small percentage of cases (<1%) - and in those cases keratoconus may be present in the other eye but undetectable. Keratoconus has been associated with atopic conditions such as hay fever, asthma, eczema, and food allergies. Other genetic diseases associated with keratoconus include Trisomy 21 (Down's Syndrome), Marfan's Syndrome, Ehlers-Danlos Syndro and memitral valve prolapse. Keratoconus does not cause blindness, except in the rare circumstances of a failed corneal transplant that cannot be treated.Â In those circumstances the fellow eye usually retains good quality vision and allows normal functioning.Â However, severe keratoconus can lead to a significant vision impairment resulting in legal blindness.Â Legal blindness means that the best vision that can be obtained by any correction is the largest letter on the standard eye chart.Â This is substantially reduced vision and well below the legal limit for driving. Keratoconus often develops in teenage years and occasionally develops during pregnancy or advances during pregnancy.Â These times are associated with elevated hormone levels; however there is no evidence of a causal relationship. Collagen cross-linking is a relatively new treatment that has been shown to slow or halt progression in keratoconus. The procedure involves using riboflavin (vitamin B2) and ultraviolet light (UVA) to significantly increase the corneal rigidity or stiffness. The treatment promotes greater cross-links between the sheets of collagen in the stroma. During the procedure, the eye is anaesthetised and the epithelium is removed, then riboflavin drops are applied regularly through the procedure and the eye is exposed to UV radiation for 30 minutes. This technique has been shown to be safe for the cornea and internal eye structures and few long-term problems have been reported to date. Other protocols which leave the epithelium in place have been shown to be less effective than the epithelium-off method. A lack of evidence from randomised clinical trials of the various crosslinking protocols now being used in Australia led to the creation of the Australian Crosslinking Registry in 2015 to evaluate the outcomes of crosslinking procedures being performed here and in other countries. The registry is a world first and is also using patient quality of life data to assess patient satisfaction with the outcome of their crosslinking procedures. Some cases of keratoconus have a hereditary component; however its occurrence is sporadic. Some 20% of patients with keratoconus have relatives with keratoconus. Consequently, even if both parents have keratoconus they are unlikely to have children with keratoconus. In some cases there is a familial association and then it is likely that keratoconus follows a dominant type of transmission. Because there is a genetic predisposition and evidence of higher rates of keratoconus in relatives of patients with keratoconus, it is important that there is regular screening for keratoconus in relatives of patients with keratoconus. This is to ensure early detection of progressive keratoconus before there is any significant deterioration of vision. In marriages between first or second cousins there is a fourfold increase in the risk of keratoconus. Recent research has shown that 33% of relatives of people with keratoconus have subtle abnormalities of the cornea, such as a slightly thinner cornea or having a slightly asymmetrical corneal shape. These subtle changes do not indicate keratoconus. These relatives have otherwise normal eyes and the corneal abnormalities do not affect their vision. The subtle changes in the cornea can only be detected by using special instruments - pachymeter and topographer (see below - detection methods). These corneal abnormalities are stable, as only a small proportion of these relatives (20%) are likely to develop to full keratoconus. Relatives of people with keratoconus may have a higher risk of developing irregularities in the corneal shape following laser refractive surgery to correct myopia or astigmatism. This is more likely in LASIK laser treatment that requires a thin corneal flap to be cut across the front of the cornea before the cornea is reshaped and thinned by the laser. Laser treatment that does not require a corneal flap (PRK - photorefractive keratectomy) is safer in these eyes. It is important that relatives of people with keratoconus who are considering laser refractive surgery, advise the practitioner so that comprehensive measurements can be made. All children should have their eyes checked around three years of age to make sure that both eyes are co-ordinating well, have good vision and are healthy. If there is a family history of keratoconus then an examination is recommended at around 8-9 years of age. Corneal topography can be reliably performed on children in this age group and can detect any early signs of keratoconus. Keratoglobus causes thinning over the entire cornea resulting in an enlarged, globular shaped cornea. Pellucid marginal degeneration causes thinning of a peripheral narrow (1-2 mm) band of the inferior cornea. Posterior keratoconus causes a non-progressive thinning of the inner surface of the cornea, while the curvature of the front surface of the cornea remains normal. Posterior keratoconus is a separate condition to keratoconus. No. Rigid gas permeable contact lenses improve vision by covering the irregular cornea with the regular focussing surface of the contact lens. The lens fitting is carefully designed to lightly rest on the corneal surface to allow all day wearing times and maximum comfort. Fitting a substantially flatter than recommended contact lens curve can significantly flatten the corneal shape, especially in a thin keratoconic cornea, however the corneal irregularity that causes poor quality vision is still present. Also the effect is only temporary and after removing the lens, the cornea gradually returns to its previous irregular shape. No - The "perfect fitting" contact lens will have even pressure across the central area of the cornea with enough lift at the edge to allow the lens to move freely and also permit adequate tear flow under the lens. As a keratoconic cornea has an irregular shape, "a perfect fitting" is often impossible to achieve. The final contact lens shape often has to become a compromise of trying to minimise any areas of hard pressure. The more advanced the keratoconus the more difficult this to achieve. A well-fitted lens, even with very advanced keratoconus will not cause an increase in the rate of keratoconic changes in the cornea. Occasionally a lens has to be fitted flatter than recommended to preserve adequate vision and these eyes need to be monitored regularly to ensure the contact lens fitting does not increase corneal scarring. Yes - Flat fitting lenses with excessive pressure on the elevated and thin cornea have been associated with increased rates of corneal scarring. This situation can arise from a practitioner prescribing an inappropriate contact lens shape. It also can occur when there has been a significant increase in the corneal curvature over time and the patient continues to wear a contact lens design that was fitted when the cornea was flatter. The result is often a lens that is highly unstable and can pop out, even a few times per day. This type of lens also has intense central pressure on the thin cornea. If this lens is worn for months or years, scarring in the cornea can often be seen in the area of hard pressure. Reduced vision from excessive corneal scarring is one of the major causes why patients finally agree to have a corneal transplant. Sometimes it can be difficult to determine with certainty if the contact lens fitting has caused the scarring or the scarring would have occurred anyway with the natural progression of the keratoconus. Certainly all experienced practitioners will try and minimise the central pressure of the contact lens on the cornea, to preserve vision and avoid any increase in corneal scarring. It also emphasises the need for regular reviews, usually every 6 - 12 months, to make sure that the contact lens fitting is still as good as possible. Absolutely yes. Poorly fitted contact lenses often lead to three undesirable outcomes. Uncomfortable contact lenses can convince patients that rigid gas permeable contact lenses are always uncomfortable and they may resist future attempts to accept them as a solution for better vision. Patients unable to tolerate an uncomfortable rigid gas permeable contact lens may stop wearing lenses and attempt to function with poor vision. This can seriously impact on their ability to study, work and engage in sporting activities. It can create unnecessary hardship and even endanger themselves and those around them, e.g. driving without lenses when they have an endorsed license, operating dangerous equipment or increased risk of falls and household accidents etc. Inability to function normally, often leads to loss of self-confidence and depression. Frustration with the unreliability of rigid gas permeable contact lenses, patients may seek unnecessary surgical solutions (Intacs, corneal transplant). No. Patients who need rigid gas permeable contact lenses on a daily basis for the best quality vision, risk serious eye infections leading to possible blindness if lenses are kept in when sleeping. Even if a serious infection does not develop, the eyes can develop significant redness and irritation and that can result in reduced wearing times and reduced vision. Even cat napping is not recommended. The best solution is to remove the lenses, clean with a daily cleaner and soak them in fresh conditioning solution and reinsert them after the sleep. If you wake up with the lenses in your eyes, insert some lubricating drops to loosen the lenses and massage the lenses through the lids to make sure they are mobile. Then remove the lenses, and seek a consultation if you eyes are very red or irritated to make sure the eyes have not been damaged. Don't resume wearing the lenses until your eyes are clear and comfortable. Even a very thin cornea can still be quite robust. A very thin cornea is usually not the reason why a decision is made to proceed to a corneal graft. Often a very thin cornea has significant scarring or distortion that results in very poor vision quality and the need for better vision results in a corneal graft. Perforation is extremely rare and is an ocular emergency. It requires immediate treatment by an ophthalmologist or at an Eye Clinic at a hospital. Perforation is treated by stitches or a special glue and bandage contact lens or corneal surgery. A corneal graft is usually required after corneal perforation. Hydrops is an uncommon complication from advanced keratoconus. A tear in Descemet's membrane (next to the endothelium) allows a sudden inflow of aqueous fluid from the inside of the eye into the stroma. This results in the dry stromal layers absorbing lots of fluid causing a sudden onset of blurred and very foggy vision and a visible white spot visible on the cornea. This is like a dry sponge that expands rapidly when dropped into water. Contact lenses should not be worn during active corneal hydrops due to the increase risk of corneal ulceration and corneal perforation. The stromal fluid is usually cleared over six to eight weeks without any specific treatment and so the corneal haze reduces. Unfortunately once the cornea has healed; it may result in corneal scarring and permanently reduced vision. Some patients who have corneal hydrops need to have a corneal graft to restore their vision. No. Laser treatment thins the cornea and it has been clearly established that LASIK will increase the progression of the cone-like distortion of the cornea.